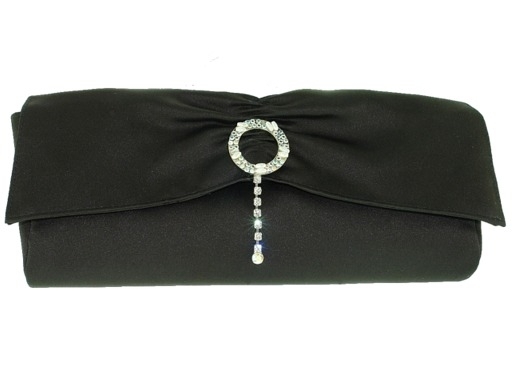 This 10" wide by 5" tall evening bag is simple and understated elegance. It is done in black fabric and has a fold over the front flap closure, with a hidden snap behind it. The front is accented with a round ring - the sign of eternity. It is set with crystals and small seed pearls, and there is a 2" crystal drop hanging down from it. There is a single strap handle, long enough to carry this bag on your shoulder or wrist, or in your hands. There is also a long black rope shoulder strap that hides away inside the bag, and a small pocket inside, for smaller items. 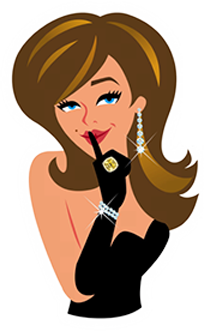 CLICK HERE to learn about our stones.